As Pratt’s Sustainability Studies minor gets set to celebrate its first anniversary of being in the catalog, the upper-division SUST offerings are enrolled to capacity. Students interested in developing the environmental dimensions of their education do have options, however. In Fall 2014, for the first time, Pratt’s Sustainable Core course is offering two sections, and both sections currently have some seats available. I am leading the Monday 2-4:50pm section and Jen Telesca is leading the Wednesday 5-7:50pm section. Each section will include participation by various Pratt instructors, giving students a sense of how sustainability is approached in design, architecture, the social sciences, the natural sciences, and humanities. This course is designed as our introduction to sustainability, and it is a required course for Pratt’s Sustainability Studies minor. This entry was posted in consumption, recycling, students, sustainability, teaching, waste on June 25, 2014 by Carl Zimring. 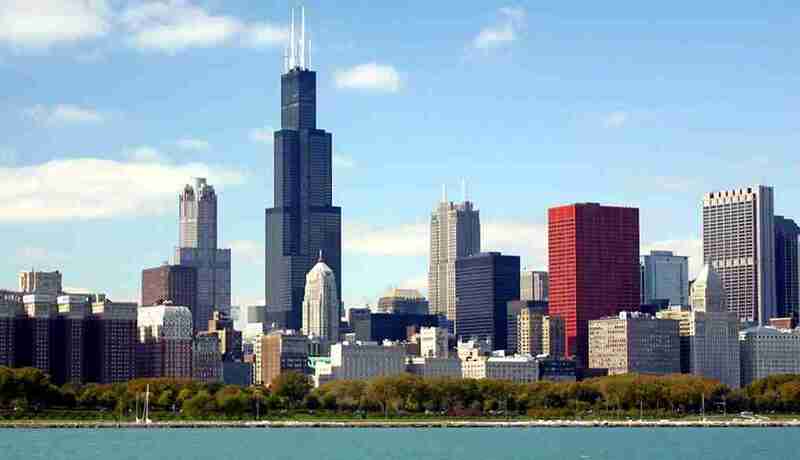 Chicago is the City That Works. But do its recycling services work? Take the survey to let the CRC know. Granted, people in Chicago make up a fraction of this blog’s readers, but as a member of the Chicago Recycling Coalition’s board of directors, I need to ask this question. Have you taken the CRC’s recycling survey? The CRC is trying to assess how well Chicago’s recycling services actually work and have developed a survey to assess services by neighborhood and building type. Aside from monitoring quality of service, the questionnaire is also a good place for you to express your preferences on how local waste management might be improved. If these services matter to you, please take five minutes to answer a handful of questions. This entry was posted in policy, recycling on June 21, 2014 by Carl Zimring. 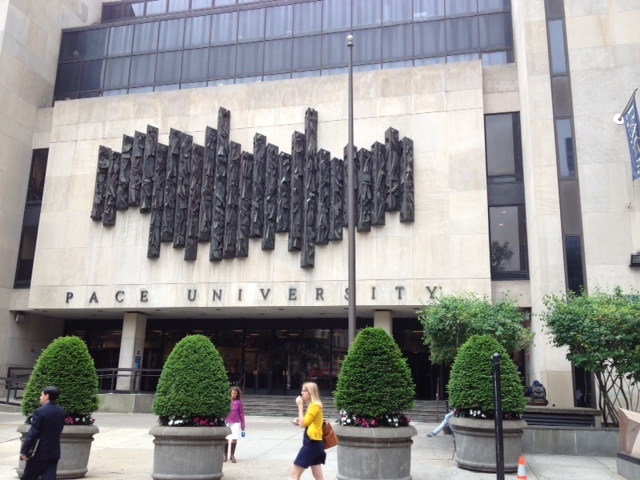 Pace University’s downtown campus, home to this year’s conference. The Association for Environmental Studies and Sciences conference met in New York City this year, allowing me to participate despite moving house the same week. AESS is a relatively new association, having had its first meeting in Madison, Wisconsin five years ago. My experiences at that meeting and subsequent ones is that AESS is a genuinely interdisciplinary conference, attracting scholars focusing on natural sciences, social sciences, policy, humanities, and the arts, so long as there is a dimension involving the environment. The arts played a particularly visible role in this year’s meeting “Welcome to the Anthropocene.” A performance troupe including actors, a dancer, a slam poet, and a sketch writer based a series of performances throughout the weekend on scheduled papers and panel abstracts. The arts also informed our discussion symposium “Design for Living: Considering Sustainability Pedagogy in Art and Design Education,” which we offered on Thursday afternoon. Our panel, Hélène Day Fraser of Emily Carr University of Art and Design, Amy Deines of Lawrence Technological University, David Bergman of Parsons The New School of Design, and I were joined by several audience members in discussion the ways we teach different definitions of sustainability in our classrooms and studios, how our curriculae are designed to engage art and design students, how concepts of materiality and life cycle assessments might inform our assignments, and what conversations art and design educators might have with the broader environmental studies community. This discussion grew out of the work several of us have done in the Partnership for Academic Leadership in Sustainability (PALS) that Deb Johnson pioneered over the past five years, and it was a pleasure to bring that discussion to AESS. The discussion was the ideal way to contextualize what we’re doing at Pratt with the Sustainability Studies minor and Center for Sustainable Design Strategies, and to learn from each other about creative ways to engage our students. I am grateful to Hélène and Amy for joining us in New York and to David for joining us not only when he (like me) is moving house, but doing so with a broken elbow. Above and beyond the call of duty, David! Thank you all, as well as the audience members; our 90-minute discussion will inform revisions I make to some of my assignments, and it was fun to boot. 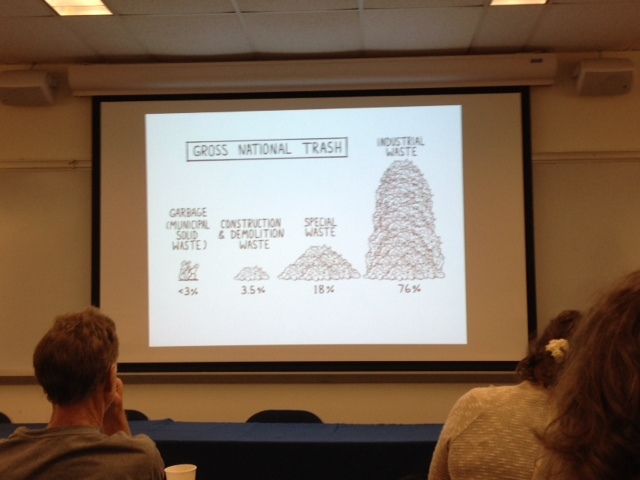 Slide from Robin Nagle’s presentation in one of Friday’s hydrocarbon/discards panels. My move limited my conference participation (though I missed the Friday field trips, I thankfully can visit such interesting sites as the Sims Sunset Park MRF facility, Newtown Creek Wastewater Treatment Plant, High Line, American Museum of Natural History, and other local sites in my own time – sometimes involving class field trios), and AESS’s rich schedule always means interesting panels conflict (for example, my new colleague Jen Telesca presented on ocean governance at the same time as the “Design for Living” discussion), but I managed to catch a few other panels. Of note were the two “Anthropocenic Discards and the Hydrocarbon Economy” panels Samantha MacBride assembled for Friday morning, featuring 3 ½ hours of engaging interdisciplinary discussion of the links between waste management and hydrocarbons. Perspectives covered ranged from architecture (with a focus on upcycling), toxicology, sociology, economics, engineering, and policy. Thanks to panelists Sasha Adkins, D. G. Webster (via Skype), Simone Feracina, Will Delavan, David Ruppert, Robin Nagle, and (once again) the highly engaged audience members who participated in the discussion. Discard studies was well-represented at these panels. It was also a pleasure to end the conference on Saturday at the “Innovative Pedagogies for Environmental Justice and Community Engagement” panel featuring Deborah Rigling Gallagher and Rebecca Vidra, Susan Mooney and her student Jess, William Grady Holt, and my erstwhile colleague from Roosevelt University’s Sustainability Studies program Mike Bryson. This panel focused on service learning approaches, especially at the undergraduate level. Though the schools vary in organization and geography, key themes in the discussion involved establishing trust with the communities in which the classes engaged and the importance of taking time to build those relationships. I enjoyed seeing the work continuing in Roosevelt’s Sustainability Studies program and also enjoyed sharing a table with Mike and emeritus RU colleague Dan Headrick at Katz’s Deli. Thanks to all at AESS for a terrific meeting here in New York City. For more on the conference, please see keynote speaker Andrew Revkin’s own recap in the New York Times or follow the Twitter hashtag #AESS2014. This entry was posted in consumption, events, policy, sustainability, waste on June 17, 2014 by Carl Zimring. This discussion takes place Thursday from 2:00pm–3:30pm in classroom G at Pace University. For registration and additional information, see the conference website. This entry was posted in events, sustainability, teaching on June 11, 2014 by Carl Zimring. One of the benefits of being on the board of directors of the Chicago Recycling Coalition is interacting with the great people and organizations working to make Chicago a more sustainable place. These include fellow board member Tom Shepherd, who also serves on the Southeast Environmental Task Force. The Task Force runs regular events educating Chicagoans on waste handling, and a notable event is coming up next week. 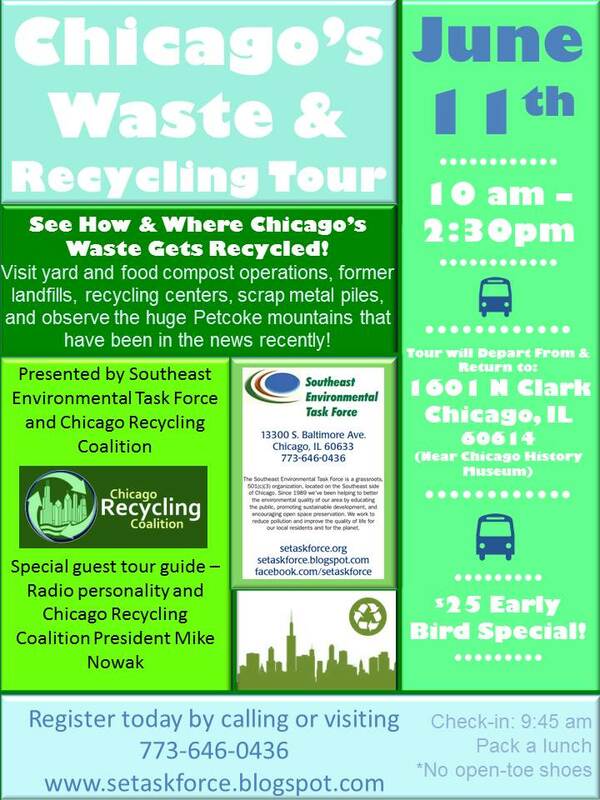 Chicago’s Waste & Recycling Tour will be held June 11 and features CRC President Mike Nowak. Attendees will see how and where recycling, compost, and also hazardous wastes like petcoke are handled locally. You can register through the links in the enclosed poster. For more information contact the Southeast Environmental Task Force. This entry was posted in events, recycling, sustainability, waste on June 3, 2014 by Carl Zimring.